We all know and love bubble. It’s great for wrapping up valuables, cushioning fragile objects, and even stress-relief (admit it, you’ve popped your way through entire sheets of it, haven’t you?). It’s awesome stuff, no question, but since it comes in rolls, it can be a little much to handle. It’s easy to cut off more than you need (or worse, underestimate how much you actually do), and storing the rest of the roll can be a hassle. Enter, stage left: Bubble dispenser boxes. They say the simplest solutions are the best solutions, and that’s exactly what bubble dispenser boxes are. A big roll of bubble is housed inside a simple, easy-to-carry box—it’s lightweight and often has a cut-out handhold on the top or side. A perforated slot on the side of the box is easily pulled away, exposing the perfect opening to pull the bubble through. And since the bubble inside is always perforated at regular lengths (12” is most common) and easy to tear off, you’ll rarely ever use too much or too little! So just what kinds of bubble dispenser boxes are there, and what will suit you best? Let’s take a look. It’s the gold standard (or is that clear standard?) in the world of bubble cushion, available in varying bubble sizes for different packaging uses and needs. If you’re looking to simply wrap up glasses, protect memorabilia, or ensure products arrive undamaged—this is the bubble you want. Don’t forget the tape to secure everything neatly together! Electronic devices aren’t just expensive—they’re sensitive, too. Static discharge can harm valuable components at any time during packing, shipping or storage, so it’s important to minimize the risk as much as you can. Anti-static bubble is specifically made to prevent and protect against static discharge, while providing the exact same damage protection as regular bubble. Plus, it always comes in a great shade of pink! Have you run out of tape? Or perhaps just don’t care for the stuff? You’re in luck, because adhesive bubble pulls double duty as both bubble cushion and its own “tape”. Objects and products are even more secure this way, as the bubble rarely shifts if applied properly. Just make sure whatever surface or texture it contacts isn’t easily marred by low-tack adhesives. Keep a damp cloth nearby! It’s one of the most interesting types of bubble cushion—bubble that sticks to itself, but not the product. This makes it highly multi-purpose in its uses, such as covering only specific parts of an item, securing an object without transferring any stickiness to it, and even being formed into makeshift bubble pouches. And just like adhesive bubble, there’s no tape needed! Bubble Wrap® IB Expressions is the most fun you can have with bubble (well, second to popping sheets and sheets of it!). If you’re getting into the branding game and dressing up your shipments in brand colours, logos and designs, don’t just stick with outside the box–jump right into the deep end of the unboxing experience. Imagine a customer opening a box to discover their purchase wrapped in big THANK YOU bubble, or bright red Hearts. That’s not a shipment they’ll soon forget! One of the great things about packaging is that there are so many options for your project’s needs. 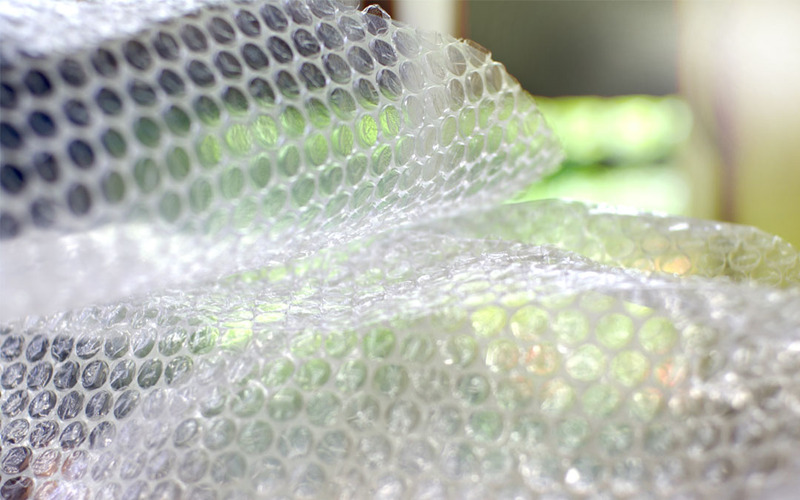 With so many types of bubble packed up in convenient bubble dispenser boxes, you might find yourself not needing (or wanting) any other kind of internal packaging material. And don’t worry, we won’t tell anyone if you pull off a sheet of the stuff, just to pass the time popping it!